Close election races bring out everyone’s true colors–and the University of Michigan sure loves its blue. It’s no secret that the culture of the Ann Arbor university is left-leaning, but now that Romney is on Obama’s tail in the Great Lakes State–Romney pulling within five points–they aren’t afraid to show it. 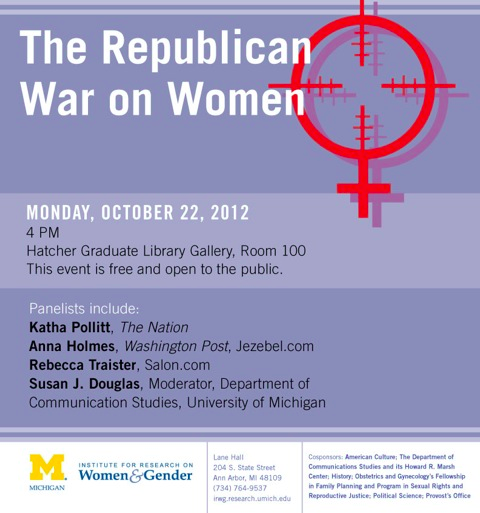 The University of Michigan violated its 501(c)3 tax status by supporting a clear, partisan event titled, “The Republican War on Women,” by using its own e-mail system to advertise for the event set to take place today. The event includes three radical left-wing journalists and will be moderated by a woman who has made contributions to the DNC and the Obama campaign. After the word got out that the university was sponsoring a leftist event, the advertisement was changed to read, “The Republican War on Women?”. According to Republican candidate Dr. Robert Steele, the question mark in the title was added after questions on the legality of the university-sponsored event started spewing. The change in the title doesn’t change the fact that it is a anti-Republican event based on the people involved. For it to be 501(c)3-acceptable event, it must have have both sides represented equally. Rachel Jankowski, the president of the College Republican’s group at the University of Michigan, was offended by the actions of her school and responding by drafting a letter to the university’s President, Provost, and Board of Regents. “For a university that totes diversity and acceptance, it shows those feel good words only apply to people who espouse its shared liberal viewpoints. Such hostile events have no place at a public university. Any use of taxpayer dollars to sponsor this event could be seen as participating in campaigns, which would be a violation of federal law,” the letter reads. As the event stands, it is a violation of the federal law. The panel includes a group of women journalists that clearly advocate for President Obama. One of them even wrote in an article that she was “ashamed” by any woman that would vote for Romney/Ryan. As a woman, I’m also extremely offended by such events. The Left claims that the GOP is undermining women, when really, it is the Left and events like this that pin women against women, gender against gender. As a conservative, I value equal opportunity for all, not opportunity by redistribution and shortcuts. The Left creates demographical warfare by using gender and race to demonize others that don’t support their ideologies. Unfortunately for the Left, facts speak louder than words. The policies of President Obama have Left 5.5 million women unemployed. The number of women living in poverty is 25.7 million. If that isn’t a war on women, I don’t know what is. Because the Left cannot run on their record, they create these demographical “wars” to demonize their opponent. It’s a shame that when the polls get tight, even “non-partisan” groups start showing their true colors. The University of Michigan is a non-partisan public school that should be providing fair and balanced arguments so students can use their own judgment. Rather, they have proven to be another corrupt organization trying to sway an election. Celia Bigelow–age 22–is the Campus Director for American Majority Action and the Founder of Students Against Barack Obama. She’s appeared on Fox News and writes frequently for The Blaze and Townhall.